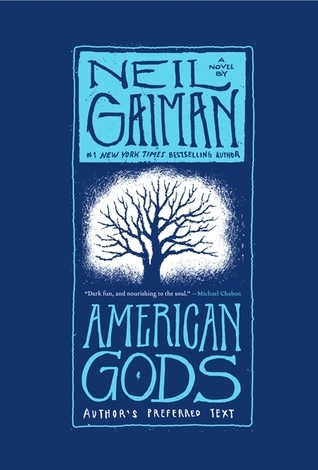 For February, On the Same Page (Alyssa, Amy, and myself) read AMERICAN GODS by Neil Gaiman as our book of choice. Neil Gaiman is a favorite author of Alyssa’s (like ALL-TIME FAVORITE) so I always feel a teensy bit of pressure when a favorite is involved! AMERICAN GODS was a new read for all of us, though, and it seemed like we all really enjoyed it! There were so many different aspects to the book that really struck my fancy and although travel really isn’t the main focus of the book, it definitely still plays a very large role and you could even argue that without travel, the book wouldn’t have had a purpose (since without travel, these gods would have never had a spot in America). Shadow and his boss Wednesday travel all over the continental United States running errands and completing tasks to fulfill Wednesday’s final end goal (which remains a mystery throughout most of the book) so besides the variety in characters, there’s also a large variety in setting. I thought about including the mythology aspect in my post but as much as I enjoyed seeing all of the gods that appeared in the book, mythology really isn’t my forte. I always enjoy reading about it but I don’t have the strong well of knowledge to expand upon it in a post so I chose quite a different route (no pun intended) with a “reading road trip”, so to speak. A great portion of the book takes place in the Midwest (and there are many places not in the Midwest as well, but that seems to be where AMERICAN GODS spends most of its time) and that happens to be something I know a lot about! So come on a road trip with me, Shadow, and the gang with a brief collection of highlights from AMERICAN GODS! First up, a complete map of all of the spots Shadow visited throughout AMERICAN GODS! I remembered quite a bit of these but this American Gods fansite (frowl.org) was a BIG help in filling in the blanks to what I had missed so I didn’t have to go back through the WHOLE book to track them all down! As you can see, this book really does span the whole country, for the most part! Lebanon, KS: Ahh, the center of the United States. Really! Here is where some characters met for errr… a very important thing (also a major spoiler so I cannot say) but it’s the center and therefore, neutral ground. Cherryvale, KS: The birthplace of actress Louise Brooks. Passing through due to Shadow’s interest! Rock City, Lookout Mountain, GA: An important gathering place for the book! “Eagle Point, IN”: A fictional place… For the sake of the road trip, I’m just estimating it’s around Indianapolis to make it easier! St. Louis, MO: Where Shadow’s plane is redirected on his way home to Eagle Point and where the story more or less begins. Minneapolis, MN: Another stop, where a… car switch happens. It doesn’t sound interesting but what’s going on at the time is! Lebanon, KS: Back to Lebanon, KS — the center of the United States. You’re home! So what do you think? 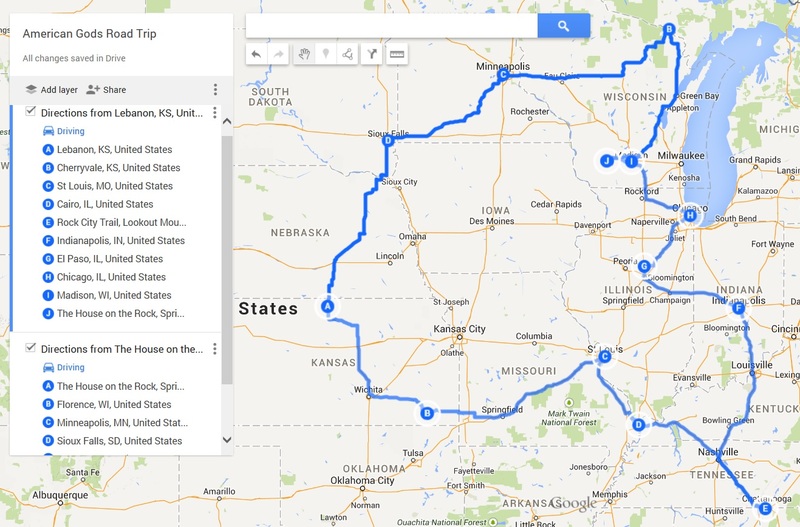 Would you take the road trip? Have you been to any of the locations from AMERICAN GODS before? Thanks again for checking out this month’s feature for On the Same Page! We had a blast reading AMERICAN GODS and sharing our thoughts with you! And don’t forget to check out Amy & Alyssa’s posts today too! This entry was posted in Adult, Books, Fantasy, Mythology and tagged American Gods, Books, Fantasy, Mythology, Neil Gaiman, On the Same Page, Road Trip, Travel on March 2, 2015 by Brittany. I was careful to avoid any spoilers but I love what you’ve put together here! 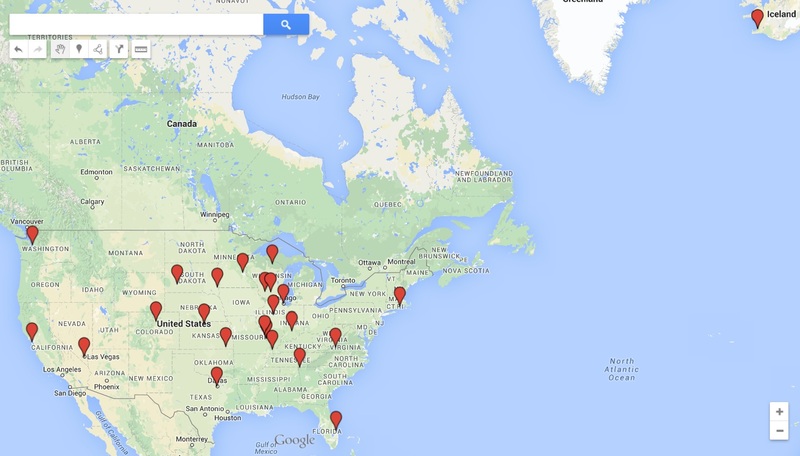 I think more bookish posts should feature maps. There have been too many people recommending this book to me recently–I have to get my copy and start it soon. Then, I’ll come back and do more prep. for my American Gods roadtrip. I did stay with friends in Springfield for a few nights and I see that is on the map! There is a fantastic coffee and tea place there that I loved–picked up some green chai loose leaf tea, and they make really good matcha! I definitely want to explore Wisconsin. Thanks for this creative post! I love this! My husband and I really want to go check out the House on the Rock. Its not that far and I”ve heard its really cool! I just visited Rock City for the first time while in Chattanooga for LibertyCon. It’s pretty awesome. I’ve been to House on the Rock, and it is even crazier than the book makes it seem! It’s a really fun road trip stop, but plan to be there a long time! I just read the book last week, and being able to picture all the described attractions made it especially enjoyable.